Iain Gordon is an independent Steinway & Sons trained Piano Tuner/Technician specialising in the servicing, rebuilding, tuning and toning of fine German pianos, and with over 25 years experience, you can be assured of the highest levels of craftsmanship. 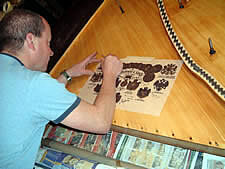 His work as a technician includes all aspects of piano servicing, from as little as a tune and check-over, to servicing on site, which can be between one and five days, and full restoration at the workshop, which is around four to six weeks work. The restoration process is a highly labour intensive operation, and the technical work alone can take around twenty or so days depending on the make of piano and extent of work required. With a full interior rebuild, no component will be left untouched. This includes unstringing and removing the iron frame and stripping down the action, keys and damper mechanism. In the case of action parts, depending on the age and extent of wear, replacement is often the best option. To restore a Steinway correctly and thoroughly requires advanced knowledge and technical skills specific to Steinway pianos alone. One example of this is the action frame, which is comprised of three rails, which if split (not an uncommon problem) must be replaced and accurately positioned to ensure good regulation is possible. The damper system of a Steinway is also unique in design and again requires specialist knowledge when being serviced and refitted. Once all the technical work is complete, the piano must then be tuned and toned. 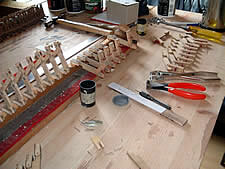 This process may take a day or two and using a variety of techniques including lacquering, needling and shaping with sandpaper sticks to achieve uniformity of dynamics and brilliance.